Queen of Peace High School hosted their “Fore the Girls” golf outing and auction on October 3rd at the Cog Hill Country Club in Lemont, Illinois. The event raised over $75,000 for the Queen of Peace Scholarship Fund. The funds will be used to help make a Queen of Peace education affordable for current and incoming families. “A great number of our students benefit from the Queen of Peace Scholarship Fund so participation in an event like our golf outing is really providing a student with the support they need to attend Queen of Peace. We are so grateful to everyone who helped support this event including our sponsors, donors, golfers, friends current families and alumnae and we look forward to building on this success in the years to come,” said Anne O’Malley, president of Queen of Peace. 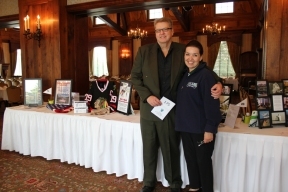 A shotgun start kicked off the day for golfers followed by a dinner that included both a live and silent auction. Some of the most popular auction items included tickets to Hamilton, a week-long stay at a luxurious Beaver Creek, Colorado condominium and the opportunity to be on the field with the Chicago Bears during an upcoming home game. Guests at the luncheon were greeted by the Peace Ambassadors, a group of students who visit local school and community events to share their experience at Peace. In addition, dinner tables were lined with note cards from current students that shared personal stories about how the Queen of Peace Scholarship has affected their lives. Although this event may be over the impact that these funds will have on Queen of Peace will be felt throughout this year and the years ahead. For more information, visit www.queenofpeacehs.org.